I've had a few questions about how I colour my hair, so I thought it might be worthwhile making a post about it. My natural hair colour generally looks a lot darker than it actually is, as when my roots grow through they are right next to my bleached hair! I've been told by my hairdresser I'm a level 6ish, so if you're the same level as me naturally this post is probably most appropriate to you, but obviously different hair types and so on influence the processing time and so on. So please don't follow this exactly, you will have your own processing time and perhaps need a different developer. This may be wrong or not perfect but it does the job for me. I'm no expert, I've picked all of this up from watching my own hairdresser bleach and tone my hair several times when I've had the money. I end up doing my own when I am lacking funds of if I'm at home, as I have never found a salon I really like at home, whereas here in Nottingham have found Jacks hairdressers to be brilliant. I went there having highlights and came out fully blonde in May last year. I was really happy with it and I've been bleaching my hair the same way, just with a different toner, ever since. Creme Peroxide, Wella Blondor, Koleston Colour (Note: I now use Koleston Rich Naturals light tones usually), tint brush, mixing bowl and scoop. I use Wella Blondor Multi Blonde Powder as this is what my hairdresser uses on my hair. I buy this larger container now. I've always had good results from this powder, but I don't think it matters massively what powder you use, I personally would rather pay for the brand my hairdresser uses in this case though! 20 vol developer lifts my hair fine. It's also preferable to avoid 30 vol (I hear...) as it's even more damaging to the hair. I also find it's better to let your hair lift gradually (50 mins max with the Wella Blondor) with 20 vol as if you imagine putting 30 vol on hair that's already a dirty blonde colour the bleaching process would probably be done within 20 mins, meaning I would only have applied bleach to half of my hair before the already bleached parts had finished processing! Nightmare situation! You need non-metallic tools when colouring hair like these; a plastic tint brush and mixing bowl are great - they're inexpensive and will last forever! I just use this kitchen measurer to measure out my bleach and developer ratios as I'm a cheapskate. Gloves will also be needed in bleaching and toning. The Wella Koleston Perfect range can be used to lighten already light hair with 20 vol developer or above, or darken for shades darker than your own hair, but I follow the instructions on the leaflet inside for 'Pastel Toning' (I think that's what it says). I dilute my 20 vol developer to 10 vol by adding the same amount of water to it, then mix with Koleston - usually I now use Rich Naturals rather than Perfect. 1. I section my hair into 4 sections (like + on my head!) and secure each section. 2. I mix my powder and developer to the ratio of 1 : 1.5 to 1 : 2 max. Basically anywhere between these two ratios, to a consistency that seems good to work with. 3. I start applying from the back of my head at the bottom. If you want a better idea of how this is done take note of how your hairdresser does it or watch a professional do it on Youtube. Take relatively thin linear sections of hair, applying plenty of bleach. Coat the underneath first then pull the layer down and apply to the top of the layer. It's important to work quickly but only apply the bleach to your natural hair - any on already bleached hair is likely to cause damage! So the key is work quickly but carefully. I get my Mum to do the back two sections of hair and I do the front as it's very tricky to do the back well yourself I find! 4. Once all the roots are coated, make sure you have really covered all your roots, especially the parts that will show in your parting. Even baby hairs need covering! 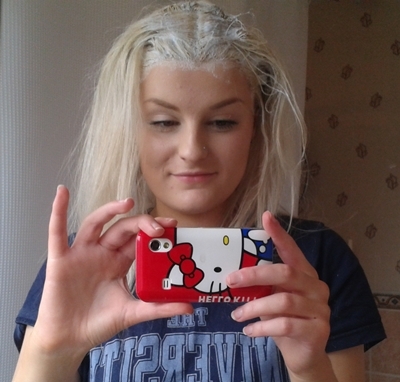 Here's a hilarious picture of how I look once my roots are all covered (about 20 mins into developing here). 5. You don't want to bleach to the colour of the rest of your hair... it sounds gross, but you want to scrape some bleach off and find your hair is a light yellowish colour. 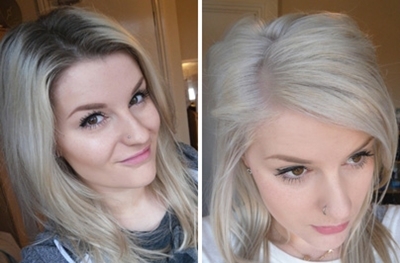 Google 'bleaching stages' if you want to get a good idea of what I mean. You can see the hair goes from orange to yellow to light yellow then white. You want to start washing the bleach off at a light yellow for a colour result similar to mine. This takes up to 50 mins on my hair, usually between 40-50 mins. 6. Wash off the bleach. Shampoo and if you need to, apply a little conditioner. I usually do as my hair is quite fine but I have quite a lot of it, so it tangles like mad. Try not to apply too much though as I remember my hairdresser saying that it can hinder the toning process. 7. You will now have hideous yellowy, probably slightly brassy, roots. Yum. To counteract this you NEED a toner. You don't reach bright blonde through bleaching alone, or you'd probably have hair that tears and looks like candy floss or, actually, none left at all! So, for my toner, I follow instructions for 'Pastel Toning' in the leaflet that comes with my Koleston Perfect tube - toner to developer 1 : 2. I simply put in 1 scoop of toner, 1 scoop of 20 vol developer and 1 scoop of water (diluting the developer to 10 vol - which will deposit colour but won't lift the hair). 8. Apply the toner at the roots first - I separate my hair into 4 again usually, applying in the same way, but in larger sections than I bleach, as I find I need to be pretty quick applying my toner for an even finish. Make sure the roots are covered well again though, I usually put a glove on one of my hands and mush the toner around my roots a bit after roughly applying it to make sure I've covered the roots evenly. My hairdresser said you shouldn't apply toner to the front of the head until it's had a bit of time to develop as it clings to this area, but I'm not bothered about this. My colour leaves a lilacy hue to these parts, which I don't mind at all! It goes in a wash or two. 9. After about 7 minutes (including the time it takes to apply) I'll take the remaining toner down the ends of my hair then comb it through. You don't want too much product on the ends / lengths as these parts are drier than your roots so the product will cling to them. 10. Once your hair has become a more even colour from root to end (some people say to leave it just 5 mins in total, I leave mine like 10-15 as I like a very light result and don't mind the toner making my hair a bit lilacy) wash it out well. I shampoo and condition after this. Then I dry my hair, applying heat protection before hand of course. Voila! You have ashy, light blonde roots once again! And lovely freshly toned hair! Sorry this is such a long post - I thought I'd go through the whole process to avoid missing anything out. I hope this has been useful to someone! EDIT: May 2013: sorry if I have not replied to questions. I am really not qualified to do so - it's best to go see a hairdresser if you are unsure about anything! it looks really nice - platinum. oh man i love the tone in your blonde! i need you to come and do mine for me haha! Thanks for the detailed instructions. Very helpful. Question: After step 6. Do you dry your hair after washing out the bleach? or just leave it wet and apply the toner/developer to that? if you use the koleston as a toner is it still permanent or will it wash out after a while like other toners? Well, I happened upon your post at my first search. I am in the United States - waaaay out West. I have been coloring my hair for over 12 years now, but I have never done my roots, nor have I had them done. As a man with short hair, I can get away with letting my color grow out. It generally turns into highlights. Then once they've been cut it is time to start all over again. I would prefer to maintain an all-one-color look though. And I plan on finally attempting this process - thanks to your wonderfully detailed instructions. Because I have such short hair, I have always used a 40 developer. My stylist does (did) this. Like you, I do it myself when I don't have the money for a stylist...which means I've done it myself for 12+ years. Even if I have the money, I find it difficult to justify spending it in a stylist now that I have the process down. But I digress. I mentioned the 40 developer because of your comment about gradual lifting sounds much better - at least for *my* roots. We're all different. I can't really separate my hair into sections very efficiently (too short). You're a lovely girl, and you've been a big help to me and likely many others. Anyhow, thanks again for the wonderful post. Could you make a video of this? I find it hard to understand things when they are written, but this is the best information I've found. Please do NOT use a high lift colorant (like the Koleston Perfect Special Blonde series) to tone bleached hair. That's just not what these colorants are made for. Because they contain a lightener, using a high lift colorant on already heavily lightened hair is like throwing a piece of fish that's already been fried back into the fryer. Always use demi-permanent color to tone lightened hair. Some color lines suggest using their permanent ammonia colors as toners if mixed with a low volume developer, but why do that when there are so many ammonia-free choices? Shades EQ, Dialight, Color Touch, and Colorance to name a few. If you can't purchase these yourself, there's a reason for that. None of them were made for home use. Maybe you will get acceptable results coloring your hair at home but keep in mind that a good percentage of a professional colorist's income is from correcting home hair color mistakes. Going to a professional may actually save you money in the end. Robyn what number of coleston you use?